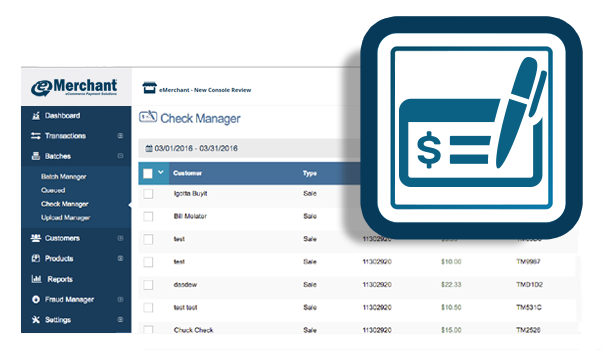 eChecks (or electronic checks) provide your business with the ability to ACH debit checking and savings accounts. Electronic checks, commonly known as eChecks, allow customers to make secure online purchases using their personal bank account. Money is electronically withdrawn directly from the buyer’s checking or savings account, transferred over the Automated Clearing House (ACH) Network, and then deposited into the merchant’s account. Our eCheck service will set you up to directly debit these accounts and quickly process transactions. Once you’ve received authorization from the customer to conduct eCheck transactions (via an online payment form or phone conversation), eMerchant Gateway allows you to enter your customer’s account and routing information directly into our software, enabling you to generate an ACH debit to any bank account in the United States. You can also enter scheduling details for recurring payments. Customer information runs through our check verification module, and if verified, it’s accepted into our system. From there, you just click the “Submit” button, and our software withdraws the payment and sends the customer a receipt. As long as the customer’s account has sufficient funds, then the payment is typically deposited in the merchant’s account within two business days after the transaction began. You can also put a payment form on your website which allows customers to enter their own account information and push an electronic ACH payment to your company. eChecks are a great option for accepting both personal and business payments. They provide a more cost-effective approach to payment acceptance compared to credit cards while been as or more secure, and having ACH payment processing ability increases payment options for your customers. Don’t wait for a check to arrive in the mail when you can instantly initiate a payment from a customer’s account by utilizing eMerchant Gateway’s eCheck service. Electronic checks are the best way to process recurring payments from customers, and they’re also an extremely useful tool for accepting donations for non-profit organizations or charities. Contact eMerchant Gateway to learn more about how we can help you with payment processing for your online business. Ready to Set-up Your eMerchant Gateway?